Explore the peaceful Don Khone Island by motor boat and visit the most beautiful Liphi waterfall. Visit the major sights of Vientiane capital and enjoy the sunset by the Mekong riverside. Discovering the mysterious Pak Ou caves and contemplating the charming town of Luang Prabang. Welcome to Laos from Thailand. You will be transferred directly to the wharf and take a 2-hour cruise by a traditional boat to Champassak. Disembark at this ancient town, known as Champa Kingdom and continue by car to Wat Phou, the UNESCO World Heritage Site in Laos. Vat Phou is the site of ruins which were one part of a temple built before Angkor Wat in Siem Reap. 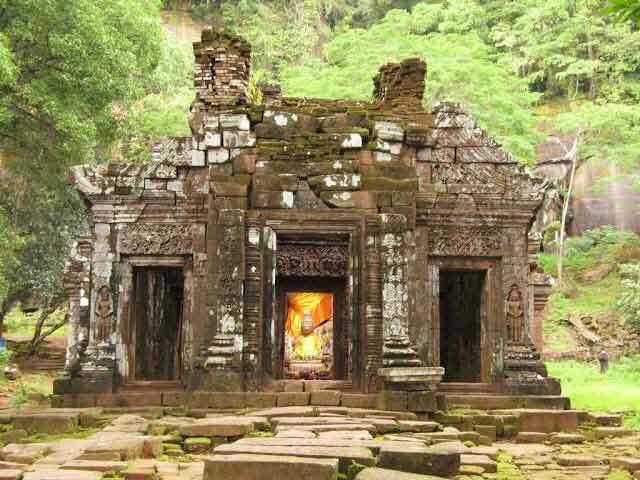 It contains some of the most ancient Khmer architectures which date back to between the 7-11th centuries. We will drive to Don Khone, an area of 4000 islands which is the widest point of the Mekong river during the rainy season. In the dry months the river recedes, making an area of thousands of islands and islets. This section of the river is also famous for being the home to the endangered Irrawaddy dolphins. En route, we stop to visit the ruins of the Khmer temple of Oup Mong at Ban Houei Tomo. We arrive the peaceful Don Khone Island in the late afternoon by a long tailed motor boat. Overnight on Don Khone Island. After an early morning breakfast, we begin by re-tracing the French colonial-past at Ban Khone, where some old colonial houses still stand and glimpse the first Lao railway with its own locomotive. We continue our exploration of the area of the 4000 islands leisurely by boat and visit the most beautiful Liphi waterfall, also known as the Samphamith, which forms a natural border between Lao and Cambodia. With good luck, we may catch a watch of the rare freshwater Irrawaddy Mekong dolphin at Ban Hang Khone. We return to Ban Nakasang and drive to the famous waterfall of Khone Phapeng - the largest waterfall in South East Asia. In the afternoon we drive to Pakse with stop in Phou Asa to visit the vestiges of the temple dating back to the 18th century. If time permits and elephants available we may get a chance to experience a 2-hour elephant riding through forest paths. 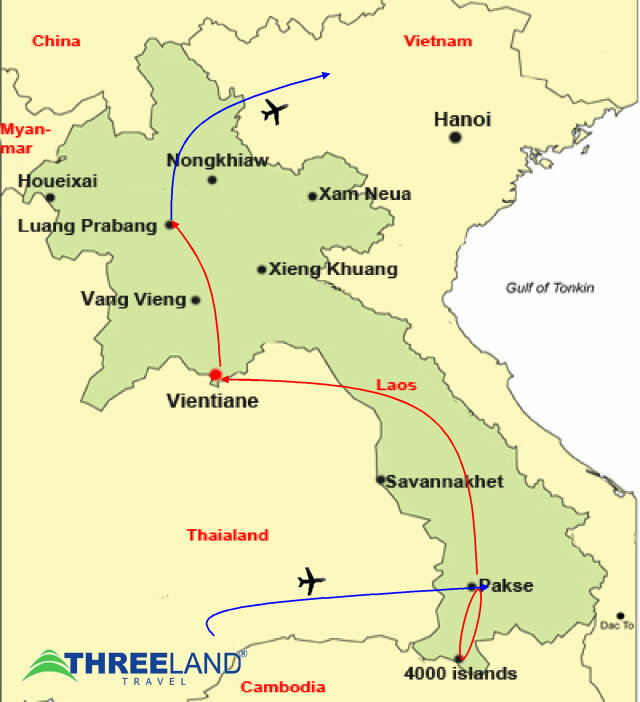 After breakfast we make an excursion to Tadlo via the plateau of Boloven, the “capital” of tea and coffee of Laos. You wil have the chance to observe the traditional coffee and tea makers. En route we visit the ethnic villages of Ban Tateng to experience the traditional lifestyles of the Alack, Katu and Nge tribes. We continue to visit the charming village of Tadlo where you will be transferred to the Tadlo resort where you enjoy swimming in the pool of the Tadlo waterfall close to the resort. In the early morning we drive to Pakse to take flight to Vientiane. After hotel check in you will start the city tour with the major sights of the capital. We visit the sacred Wat Sisaket, the oldest temple with thousands of miniature Buddha statues and the former royal temple of Wat Prakeo which previously housed the famous Emerald Buddha Image. On the way to the famous and sacred structure of That Luang Stupa, we stop to take some pictures of the imposing Patuxay Monument, which is well known as Vientiane’s own Arc de Triumph. Enjoy a sunset by the Mekong riverside and overnight in Vientiane. In the morning your will be transferred to the airport for a short flight to Luang Prabang. 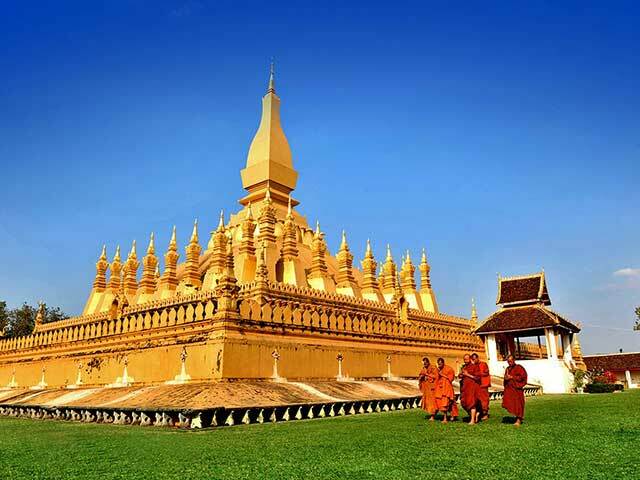 After hotel check in you will visit Wat Visoun, the site of the impressive Thad Makmo stupa. The rounded dome is more Sinhalese in style than Lao. We climb 350 steps to Phousi mountain to enjoy impressive views of the surrounding area. Wat Phou Si sits on top of the mountain, alongside the skeletons of Indochina war anti-aircraft guns! We then continue to visit Wat Mai built in 1796, this five-tiered roof of the wooden Sim (chapel) emphasizes the graceful Luang Prabang architectural style. We explore street night market, where you will find a lovely collection of local handmade textiles of the hill tribes surrounding Luang Prabang. Today, we enjoy a short-guided tour of the city’s oldest temple Wat Sene and the magnificent Wat Xiengthong with its sweeping low roofs, which represents the classical architecture of Luang Prabang temple. 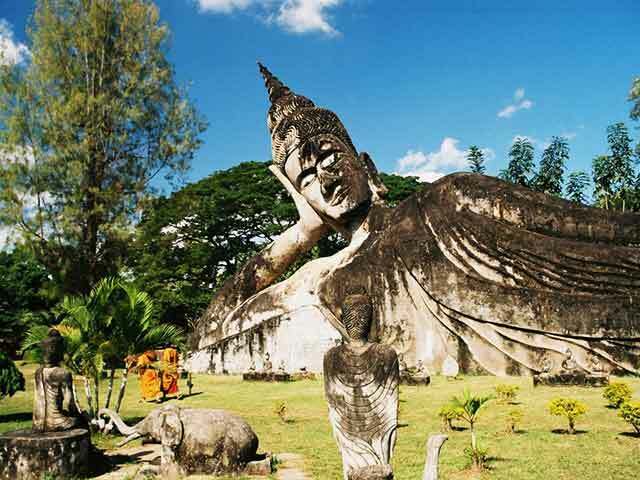 We then embark on a boat journey upstream along the Mekong river, which also gives us a beautiful view of the tranquil countryside as well as an interesting visit to the mysterious Pak Ou caves, two linked caves crammed with thousands of gold lacquered Buddha statues of various shapes and sizes left by pilgrims. En route, we stop at the village of Ban Xanghai, where the local specialty of rice wine is produced and visit Ban Phanom, well known for its hand weaving. After breakfast, we visit the National museum (close Tuesday), which was once a king's palace. Displayed inside this museum is a collection of personal artifacts from the royal family, including photos, musical instruments, and many gifts received from the dignitaries of foreign countries. Finally you will be transfered to the airport for departure. End of services.